Fall is here, and it’s time for cute family pictures, sweaters, apple cider, and pumpkin-flavored…everything! The pumpkin patch is such an enjoyable fall attraction for kids and adults of all ages, and a great way to be active as a family. Pumpkin patches may have any number of activities so use that as an opportunity to enjoy the fall weather and get moving. Go through the corn maze – A great way to race and be active with the family! If there is an apple orchard available, get picking and try an Apple Cucumber Slaw, Homemade Apple Butter or Microwave Baked Apples. 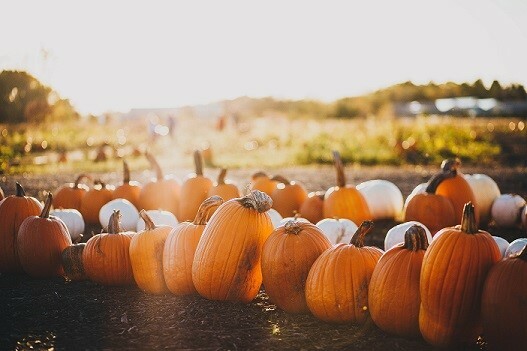 Spend time in the fields picking your own pumpkin (if allowed) and try Roasted Pumpkin-Apple Soup or Roasted Pumpkin Seeds. Find out in advance if food is available for sale. You may want to bring your own healthy snacks or lunch and have a picnic. A really fun activity for younger kids is to make a silly face with the pumpkin to avoid the mess of carving. Here are my nieces and nephews creation, featuring Mr. and Mrs. 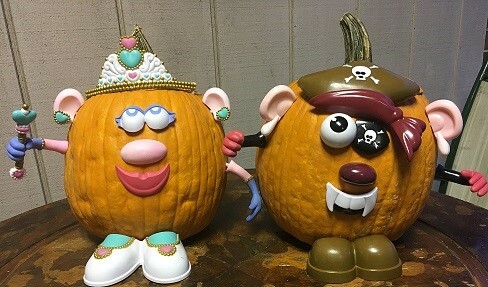 Potato Head pieces!